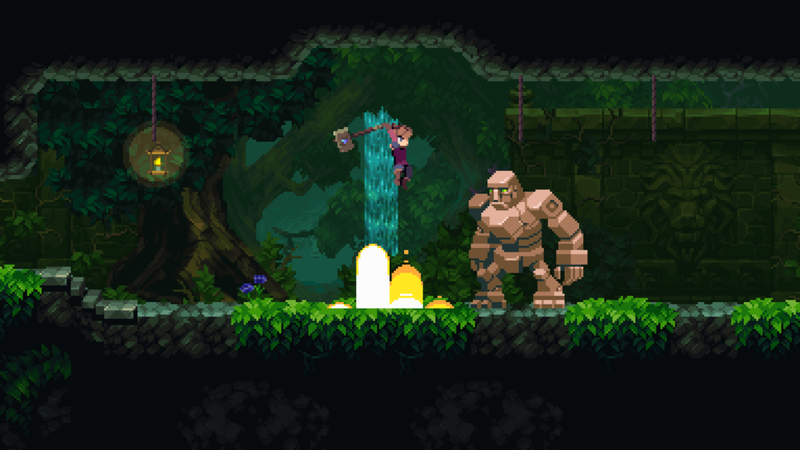 Chasm is a side-scrolling action-platformer by Bit Kid. 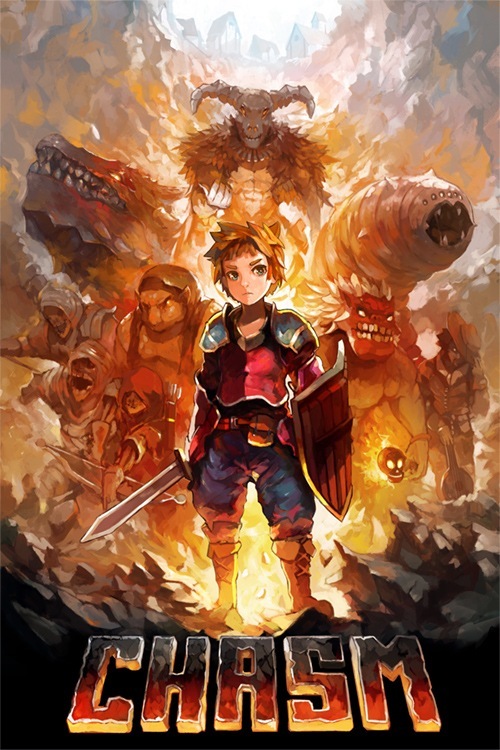 It features SOTN-styled gameplay and procedurally generated dungeons. You play as a new recruit to a Kingdom, where your superior sent you to a nearby mining village to investigate a case of missing people. You arrived at the village Karthas to find that all but one person were missing - and the mayor gave you the key to the mines so you can start exploring. The game features six dungeons, namely the mines, the catacombs, the garden, the keep, the temple, and the magma chamber - each with a boss at the end. One of the main selling points of Chasm is that the maps are procedurally generated. Practically, it means that a blocks of rooms handcrafted by the designer for each dungeon would be randomly connected together. The content of the treasure chests also seemed to be randomised. Theoretically, the procedural generation should improve replayability. However, from what I observed, the generated dungeons are never wacky enough to induce new playstyle or new tactics; and the size of the dungeons is always small enough that it is easy to explore every possible location before moving on - regardless of whether the dungeon is new or not. So rather than inducing a feeling of "I wonder what is in the next room...", it is more like "Oh, I know this room configuration, so I know I cannot go pass until I get a double-jump." Speaking of double-jump, there are many different jumping/moving abilities - which can be confusing when you expect the first upgrade to be the only one, and you are still not able to reach certain places after the third or fourth upgrade. As a whole, there is not a lot of platforming in this game, but it can get frustrating sometimes when combining with the knock-backs. In terms of combat, you always have a melee attack and a magic attack - both of them are heavily inspired by Castlevania. There are many weapons in the game, from daggers to swords to whips to hammers. There are also weapons with special effects, like life-stealing and AOE effects. Being able to choose (or switch between) combat styles and finding better and better versions of the weapon type is definitely enjoyable. For magic, you can choose from a variety of Castlevania-esque spells like holy water, crosses, axes, and magic knives. You can also upgrade them. The relative effectiveness of weapons versus magic of course depends on the enemy, but also the stats that you have. You have four stats, namely strength, intelligence, constitution and luck - and you can change your equipment to boost up either strength or intelligence in order to increase your damage input from weapon or magic. Weapons, equipment, healing items, and crafting materials can all be found in the dungeons - as well as purchased in the village once you start rescuing the missing villagers and, for some, after completing their mini-quests. Although it is mentioned in their Kickstarter page that the game was inspired by Diablo, I personally felt that there is a lack of loot in the game. Most enemies in the dungeon do have the ability to drop loots, but not often - even with boosted luck stats. Low drop rate, the lack of money, and the limited stock in the shops means that one might need to grind for consumables - healing items if you are not the most skilled, but also crafting materials and gemstones for upgrading spells. This may be a negative for some people, but for others it is an enjoyable activity, and a balancing mechanism to overpower bosses by being over-levelled and by having tons of healing items. I think this game is an enjoyable time. If the developer's aim was to design a Castlevania-esque game with procedurally generated levels, they technically succeed. On the other hand, some people (especially people who kickstarted the project and waited years for it) complained that the game lacks content. The procedurally generation also did not add much to the gaming experience, and might not be preferable to a single well designed map. Developer / Publisher: Bit Kid, Inc.